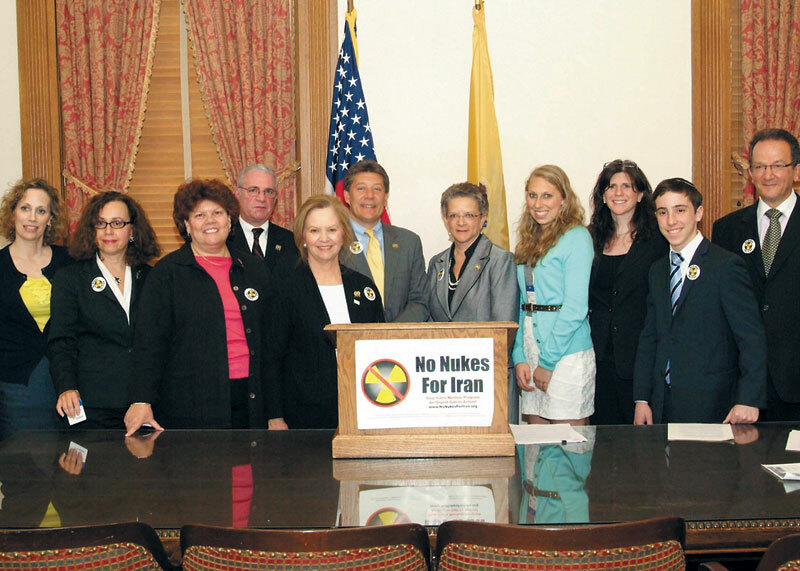 Inspired by a group of teens determined to keep Iran from becoming a nuclear power, the New Jersey Assembly passed a bill urging the federal government to strengthen sanctions against those doing business with Iran’s petroleum sector. The legislation, passed unanimously May 9, was sponsored by Assembly members John McKeon (D-Dist. 27), Mila Jasey (D-Dist. 27), Linda Stender (D-Dist. 22), and Gary Schaer (D-Dist. 36). A similar resolution is expected to be introduced by Senate President Stephen Sweeney on May 12. “It’s a good day,” said Jasey as the vote total was announced by Assembly Speaker Sheila Oliver (D-Dist. 34). The resolution urges the federal government to increase sanctions, carry out financial divestment, and bring additional economic pressure to stop Iran from going nuclear. McKeon was inspired to sponsor the legislation after meeting Danielle Flaum of Millburn, founder and president of the No Nukes for Iran teen advocacy group, at last year’s Super Sunday fund-raising event of United Jewish Communities of MetroWest NJ in Whippany. Danielle was invited to attend the Assembly session along with fellow teen advocate Benjamin Lankin of Highland Park. Both spoke at the May 9 press conference and were invited by Jasey and McKeon to sit in their Assembly chairs to cast symbolic electronic “votes” on consent items. “I believe Iran should not be allowed to become a nuclear threat to the U.S. and the world community,” Danielle, a senior at Millburn High School, told NJJN as she and Benjamin worked the Assembly chamber before the start of the session. 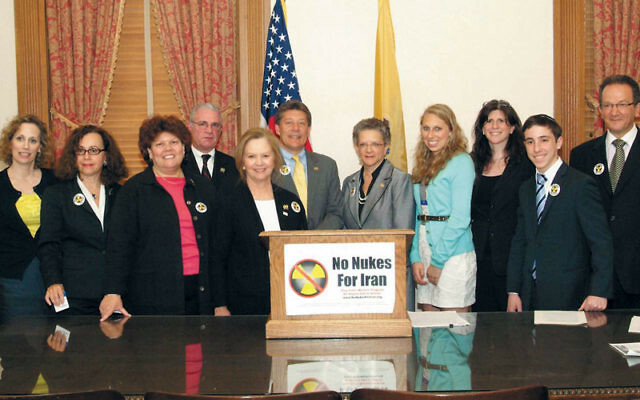 They handed out “No Nukes for Iran” buttons, which many of the legislators then sported on their lapels. The teens were accompanied by members of the Stop Iran Now task force of UJC MetroWest’s Community Relations Committee, who had invited members of other organizations to join them at the press conference. Among them were Jacob Toporek, executive director of the NJ State Association of Jewish Federations; Ferne Hassan, associate director of the Metro New Jersey region of the American Jewish Committee; and Melanie Roth Gorelick, CRC associate director. New Jersey became one of the first states to pass Iranian sanctions legislation three years ago, divesting itself of 14.5 million stock shares worth more than $489 million. Last year, President Barack Obama signed the Comprehensive Iran Sanctions and Divestment Act into law, penalizing companies that support Iran’s petroleum sector. However, Daniels said, to date only one company has been sanctioned while other companies continue Iranian operations through loopholes and as the result of a lack of diligent enforcement measures. In February, U.S. Rep. Kirsten Gillibrand (D-NY) introduced a bipartisan bill to close those loopholes. In their remarks, both Danielle and Benjamin delivered scathing condemnations of Morristown-based Honeywell International, where the No Nukes for Iran campaign has organized demonstrations and letter-writing campaigns for the last year. “I am here today to remind you, our elected officials and New Jersey citizens, that the youth of New Jersey will not be silent as businesses in our backyard continue to do business with Iran,” said Benjamin. Danielle urged all elected officials to put pressure on Honeywell, which she said was not “morally in compliance” with the sanctions act. She added that the company has claimed to be winding down business but has yet to give a timeframe.